Despite the ludicrous earnings-driven selloff, Centaur Investments firmly maintains a “Buy” opinion and $15 price target on shares of YRC Worldwide, Inc. (YRCW). The motivation for this opinion comes from our view that analysts’ rosy estimates (including our own) were perhaps far too unrealistic going into the quarter. In other words, the company didn’t miss analyst estimates. On the contrary, industry analysts missed the entire picture by failing to demonstrate sound judgment when making their projections for the quarter. This was a categorical error and we explain our reasoning here in this article. We continue to like management’s specific emphasis on yield improvement over revenue maximization. 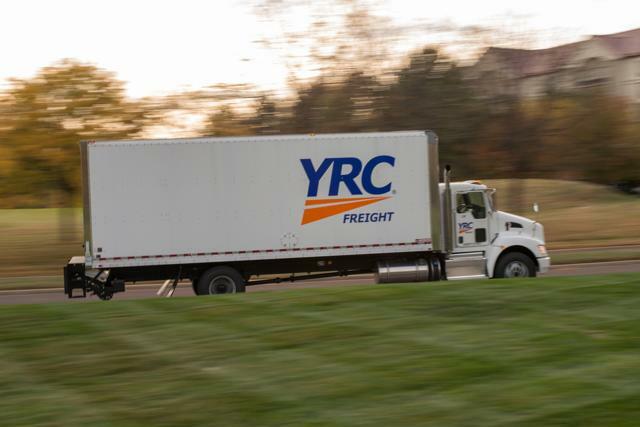 In an environment where many carriers are scrambling to push freight across increasingly tight networks, YRC continues to focus on profit-maximizing shipments over tonnage. This strategy has consistently proven to be adequate as the company ramps up on revenue equipment replacement and modern technology deployment. We expect the selloff in YRC’s shares to abate and eventually reverse as soon as market participants have had enough time to digest the whopping $31M in proceeds ($29M gain) from the sale of two docks located in Harrisburg Pennsylvania. According to CFO Stephanie Fisher, the deal closed just this week and will hit operating income in Q4. During the Q2 2018 conference call, management did note that these two docks had a pending sale as a result of network enhancements implemented in Q4 2017. As A Note to the Reader: This article will dig into the company’s progress since we last shared our opinion on the company. All pictures, data, and information cited throughout the article may be found in the company’s quarterly and annual filings, company presentations, and conference call transcripts. 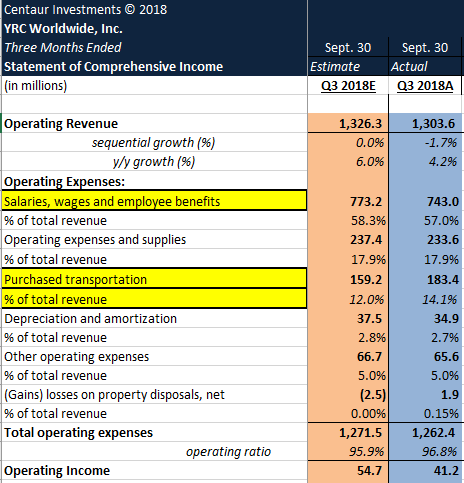 In Q3, YRC Worldwide posted a modest revenue beat but disappointing earnings of $0.09, compared to a range from analyst targets of $0.51 to $0.60. The results were in line with Q3 2017 but down sequentially. Long-term debt continued to trend lower and ended the quarter at $836M including equipment leases. Liquidity was higher with cash and equivalents approaching $200M. In our opinion, these were overall pretty good numbers. Total revenue sustained the recent trend of roughly 4-5% in year-on-year growth. Revenue equipment replenishment was at $32.2M, and capital expenditures were at $45.9M, for a total reinvestment of $78.1M. A significant increase of $30.3M or 63.4% over Q3 2017 capital reinvestment. Year-to-date, the company has taken delivery of 1,000 new tractors and 2,300 new trailers. The company expects to add an additional 300 new tractors and 1,500 new trailers by year end. Management noted that the reinvestment is translating directly to the bottom line, despite analyst skepticism. We will discuss a little more about analyst sentiment in a later section. The new equipment helps reduce maintenance and fuel expenses, as well as equipment rental expenses, and is a key reason why we didn’t pay too much attention to the earnings miss. In the end, it was ~$13.9M in one-time nonrecurring charges which caused the big earnings miss. The big earnings miss was due to a nonrecurring $5.5M liability charge, $7.2M pension settlement charge, and $1.2M loss on equipment disposals. Combined, the surprise impact on net income totaled $13.9M. 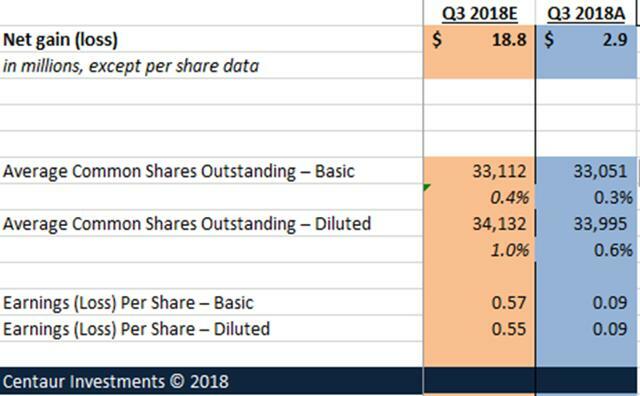 Taking the $2.9M in net earnings and adding back in these one-time charges, non-GAAP adjusted net income came in at $16.7M, for about $0.51 in non-GAAP adjusted earnings per share. This falls near the bottom range of analyst earnings estimates and is very close to Centaur’s estimate of $0.55 in fully-diluted earnings. Investors should have expected the $7.2M in pension settlement charges disclosed in September’s preliminary update. Both nonrecurring $1.9M loss on property disposal and $5.5M liability charge were a bit of a surprise, despite no significant weather-related impact found in the report. Additionally, management did not note anything significant regarding Hurricane Florence or any other weather-related impact during the conference call. Most notably, operating cash flow, adjusted non-GAAP earnings per share, and both EBITDA and non-GAAP EBITDA remained on a solid trajectory. Non-GAAP adjusted EBITDA totaled $84.2M and was ~3.4% higher than the $81.4M reported for the same period last year. For the trailing twelve months adjusted EBITDA is trending 5.8% higher. Additionally, the company now trades at just 3.7x EV to adjusted EBITDA, 0.21x EV to sales, and 0.04x price to sales. An insanely cheap valuation by all measures. Relating back to the $31M windfall set to hit operating income in Q4, our income statement model assumed the sale would close during Q3 but included only a modest $2.5M gain. However, as Fisher noted on the call, the full dollar amount will be included as part of operating income in their Q4 and full-year reports. The income statement below shows how close Centaur’s model came to actual results. One thing implied in September’s article was that the company was on the brink of turning a corner on profitability, with margin improvement and earnings growth. This was ‘implied’ because the thesis initially did not lay out a timeline and focused almost entirely on the Q3 earnings report. Additionally, the analysis incorrectly assumed analyst comps would be easy to beat due to weather-related impact during the same quarter last year. Instead, analyst anticipated this and set unreasonably high earnings projections despite historical earnings sensitivity to one-time charges. To recap the six key factors presented as part of the long thesis in September’s article, these key factors are summarized for the reader below. Favorable pricing environment will continue to generate solid revenue growth. Management’s focus on yield improvement over revenue maximization will drive profitability. Deployment of modern technology will drive margin growth through network optimization. Accelerated revenue equipment replacements will derive efficiency benefits and improve operating performance. Eventual phase out of long-term equipment rentals will show immediate improvement in operating expenses and operating ratio. Progress on Teamsters Union labor agreement would eliminate substantial risks weighing on the company’s shares. To specify, the timetable for investors to start taking notice of these factors is generally over the next year, as the pickup and delivery tech gets rolled out across larger facilities and distribution centers. Over the next two to three years, assuming a strong freight pricing environment, the tractor replacements should start to positively impact profitability as the cost of maintenance and fuel is driven lower. Again, management has noted that new tractors bring in an immediate 15% cost reduction. Before explaining the categorical error in analyst estimates for the quarter, it is important to outline the known information. The idea here is that by understanding where the company is positioned today, analysts can reduce the likelihood and frequency of errors in future estimates for the company. First and foremost, let’s began with a list of known information which should not come as a surprise to anyone. At least, anyone who has followed the company at some point in the last 10 years. This list comes in the most directly transparent way possible for readers to really visualize the bigger picture. The success of the company is dependent upon cooperation with the Teamsters Labor Union, as both parties face a deadline to renew their labor agreement by March 31, 2019. With 30,000+ employees, a bit of back of the envelope game theory analysis should conclude that both union workers and company management are well-aware of what’s at stake and will find common ground. The company’s fleet of ~14,000 tractors and ~45,000 trailers is much older than their publicly traded competitors. The company started replenishing their fleet in 2015 and in 2018 is merely 25% to 30% deployed on their fleet replenishment plan. Most of the company’s operations must work with legacy warehouse and transportation management technology to meet analyst expectations. The company started deploying Optym, Quintiq pickup and delivery systems across their network and has installed the technology at 100 out of 384 facilities, that’s less than 1/3. The technology has to be customized for each terminal and distribution center, so deployment in slower than the typical out of box on-premise installation. In the near term, management is choosing to invest excess cash to accelerate both fleet replenishment and technology deployment rather than post record profits. Market participants are myopic by nature and are difficult to please as they tend to have exceedingly lofty expectations for the company. Short sellers and intraday traders are the enemy of C-level executives, and many speculators still mistakenly assume the company faces insolvency risks. With these facts now out of the way, this opens the door to discuss the categorical error in analyst estimates. To start off, anyone who listened to the Q3 conference call may have noticed that analysts were quick to point out the obvious. That is, they all brought up at least one of the points just listed above, despite being industry experts and long-time followers of the company. Under this rationalization, one can draw two conclusions. First, analysts do not seem to be rationalizing the facts they already know about the company and as a result consistently fail to demonstrate sound judgment when projecting earnings for this company. Second, both speculators and investors pay close attention and react to the tone set by analysts during these conference calls. By asking unreasonable questions, they’re not only wasting their time, they’re putting management in a position where anything they say (or don’t say) risks communicating the wrong message. One thing analysts could do better is to simplify the logic of their questions and leave out their attempts for rationalization. For instance, rather than point out the age or fuel economy of the fleet, one might simply ask how much progress was made on fleet replenishment and/or technology deployment during the quarter. Any prior information could be easily determined by replaying older conference calls or using the quick search function on transcripts and 10Qs/Ks. This point falls in line with the concerns of Tesla Inc. (TSLA) CEO Elon Musk, and growing number of CEOs who have been actively fighting back short sellers and intraday speculators. Not to side with any of these executives or go as far as suggest Tesla is a great investment. Rather, their side of the story makes it understandable why they feel so compelled to fight back against the negative sentiment. Navigating social media sites like Twitter (TWTR), StockTwits, and other message boards, it becomes clear that intraday traders or “swing traders” have identified this company as a volume mover following earnings announcements. The volume spike in the year to date stock chart above speaks for itself. Additionally, some speculators have formed a pattern around cyclical periods for the company. It may well be that this activity has led to increased volatility in the shares. An accurate representation of this can be determined from a comment left in this article by a reader on the night before the company reported earnings. While the reader was correct in his prediction, many other short-term speculative traders shared this view. It was hardly an analysis or valuation of the company at all. Rather, a guess as to what side momentum would be exhibited following the earnings announcement. Though this trader should be congratulated for his accurate and profitable prediction, it should also serve as a warning for long-term investors about paying too much attention to intraday trends. As trading volume starts to pick up, other traders want in on to the action and enter similar trades. For existing shareholders, these price swings could be enough to entice panic and forced selling, very often leading to an exaggerated price move. Investors and traders have mentioned another reason for the share price decline, the notion that the company has failed to demonstrate superior performance, despite operating in one of the strongest freight environments in over a decade. While this is a genuine question to ask, and it partially explains why some analysts consistently get earnings projections wrong, this question demonstrates disregard for the facts. How does one expect to see the company outperform peers who did not face the same challenges ten years ago? Indeed, most industry peers are operating with far more efficient fleets. This is one of the known facts outlined earlier. Yet some still question why YRC’s earnings are missing higher marks. Similarly, some less experienced investors tend to associate the company with insolvency risk. The company has managed their liquidity responsibly and paid down their debt to manageable levels. Equipment leases now account for most of the long-term debt on the company’s balance sheet. It seems highly irrational to assume that the company is moving on a path towards financial trouble. A worst-case scenario would be a dramatic drop in the freight environment, such as the one which started in late 2007. In such an event, YRC would have enough liquidity on hand to pay down long-term debt. Additionally, as mentioned in September’s article, with the company now operating a much more flexible fleet, in a case like this, management could reduce the size of the fleet as the leases come up for renewal. Leaving the company in a far more manageable position than it was when it entered the financial crisis ten years ago. Centaur initially found the company a compelling opportunity due to the increasingly negative investor sentiment towards the shares, as speculators find every opportunity to sell or short shares and often refer to the company as a “POS” on social media. We looked at the company, broke it apart, and combed through historical financial statements and determined that there was a whole lot more value to be created. With a fleet replenishment plan in place and modern technology being phased in, no value is being destroyed despite the market’s punishing behavior. This negative sentiment seems to be driven by the company’s performance relative to aggressive analyst targets, and the aftermath of missing those targets. Blaming mismanagement or the company’s older fleet is a categorically flawed observation. There are other good points to make here. In the past, the company’s operations have proven increasingly sensitive to small one-time charges such as insurance claims and weather-related events. Even with the company constrained due to limitations imposed on by restrictive debt covenants, it is not at risk of insolvency as many speculators appear to see. Additionally, the highly restrictive debt covenants may have actually been a good thing for the company. For instance, the company has avoided taking on dangerous levels of debt. In fact, the opposite has been true. They actually consolidated and paid down most of their long-term debt during a period where interest rates were at historical lows. Incidentally, the incentives for borrowing heavily to fund aggressive expansions or share repurchases had never been higher. In YRC’s case, the company has been literally forced to optimally reallocate the cash flows the business has generated. A dream for the value investor. This has dramatically lengthened the time it would take to achieve more competitive margins and earnings. Nonetheless, management has achieved to pay off debt and gradually introduce new technology and equipment through optimal allocation. Using Tesla as the opposite example, many companies are unconstrained by these limitations and have found it easy to issue additional equity or debt to finance their expansions. Others have forgone value creation and elected to waste tax benefits by funding share repurchases instead. With sentiment and categorical errors now addressed, let’s move on to the valuation segment. In this next section, we introduce an updated version of the discounted cash flow model we have been using to approximate the intrinsic value of YRC’s equity. Fair Valuation and Price Target for YRC Worldwide Inc.
With Q3 free cash flow remaining in line with our projections, the revision applied to the model from September was minimal. The change involved updating the model with the latest risk-free rate of return from 2.9% to 3.2%. The discount rate ticked down by one-tenth of a percent, producing an equity valuation estimate of $487M, up from $479M in September’s model. 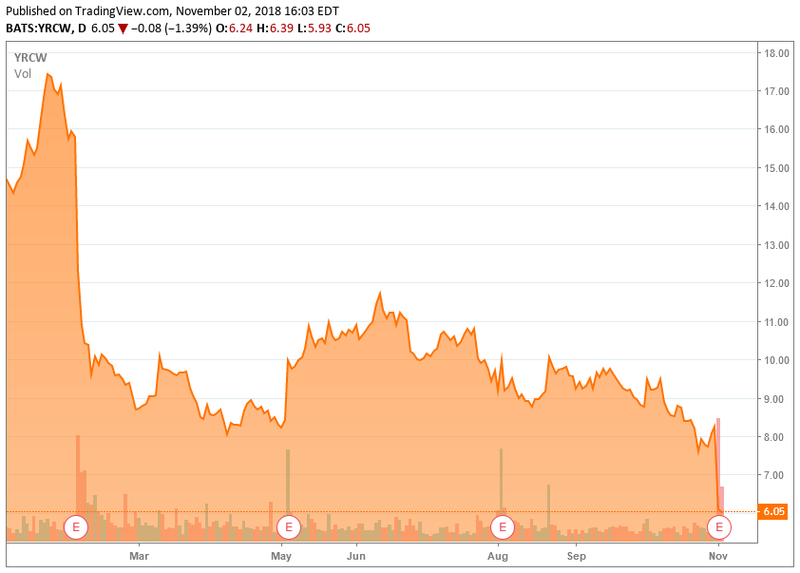 The target price per share remained unchanged at $15 due to rounding. The main takeaway here is that if our analysis proves correct, investors could reap a +140% return from buying the shares at the currently discounted price of $6.04 which was quoted at market close on November 2. As a caution, investors should be aware of YRC’s CFO comments during the Q3 conference call and should expect to see an additional non-union pension settlement charge in Q4 ranging from $3M to $7M. These charges will be largely offset by approximately $31 million in net cash proceeds which will reflect in Q4 operating income and adjusted EBITDA. The expected net gain from the property sale is approximately $29 million. These projections indicate that the full year results should remain within the assumptions of our model presented above. Some investors often use the expression of “righting the ship,” to describe turnaround stories. Using a similar analogy, we see YRCW not as a sinking ship but rather, a ship moving along a slow current. With the slow and steady pace of reinvestment, it will take some time to show before investors and analysts start seeing those larger impacts on margin they’re so anxiously waiting to see. In our opinion, YRC may be a strong case for a buy and hold investment. Until investors come to this realization and shake off their exceedingly lofty expectations, YRCW’s shares will continue to be vulnerable to violent swings due to intraday speculative action. Investors should take advantage of market fluctuations and stand prepared to buy shares during dramatic selling events like the one this week. Ideally, this would limit speculative short selling and stabilize the volatile share price. If management remains disciplined and ignores the demands of intraday speculative traders, YRC has the potential to overtake a lot of their industry competitors. This could go about if faster growing competitors experience early pain from making the same mistakes predecessor Yellow Corporation made nearly twenty years ago under the command of former CEO, William D. Zollars. The slimmer and more strategically disciplined YRC, would find itself in the right position to take advantage and capture additional market share. For a notable example of careless expansions, one could look no further than XPO Logistics Inc. (XPO). XPO’s Chief Executive, Bradley “Brad” Jacobs, has developed a cult-like following for his bold acquisitions. Now XPO investors are left wondering when Brad will be closing in on the $8 billion in acquisitions he planned for 2018. Unarguably though, XPO’s freight brokerage operations have helped the company achieve record growth year to date. Additionally, as ecommerce continues to gain over traditional brick and mortar, large competitors like United Parcel (UPS) and FedEx Corp. (FDX) continue to struggle with tight capacity, timely delivery, and expansion challenges. In the long run, YRCW has the potential to expand last mile delivery, and tap into ground shipping markets by introducing less capital-intensive revenue equipment such as medium-duty straight/box style trucks and light-duty delivery vans. In closing, we remind readers of the six points in Centaur’s long thesis which offers a more positive take on the company. We like the level of discipline and focus YRCW’s management is demonstrating. Many management teams lack this ability, especially in dynamic high-frequency trading environments like those today. Investors and speculators alike have a tendency to forget what an equity share represents; an ownership stake in a physically operating business. With this closing argument, we stand by our previously disclosed cash flow model, valuation, and price target for the company. We hold a contrarian take on the increasingly negative investor sentiment towards the company and overall shares of truckload and less-than-truckload carriers. As industry capacity remains tight with strong demand for heavy-duty class 8 trucks, and beset by driver shortages, there may be continued pricing strength in freight markets to boost the sector higher. As one of the most oversold companies in the sector, YRC Worldwide seems poised to see the biggest return over the next twelve months. Given the company’s appealing current market valuation, and variety of factors outlined in this article, Centaur Investments continues to hold a “buy” opinion on shares of YRC Worldwide Inc., and maintains the previously disclosed $15 price target. As the company closes in on negotiations with the Teamsters Union, we expect for the market to react favorably to any news of improving agreement ratification probability. In the meantime, we will continue to monitor company filings and industry developments and update YRCW’s valuation as additional information becomes available. Disclaimer: As always, past performance is not an indicator of future performance. This post is illustrative and educational and is not a specific offer of products or services. Information in this article is not an offer to buy or sell, or a solicitation of any offer to buy or sell the securities mentioned herein. Information presented is believed to be factual and up-to-date, but I/We do not guarantee its accuracy and it should not be regarded as a complete analysis of the subjects discussed. All expressions of opinion reflect the judgment of the authors as of the date of publication and are subject to change. Please conduct your own due diligence prior to investing in any of the securities mentioned in this article. Disclosure: I am/we are long YRCW.